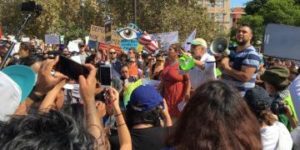 The Los Angeles Chapter of the National Lawyers Guild condemns the government’s ongoing campaign to intimidate immigration lawyers from representing their clients. On January 4, 2018, US Immigration and Customs Enforcement (ICE) agents intruded into the immigration law offices of Amoachi & Johnson, PLLC, ignoring signs stating that ICE agents were prohibited there, to personally serve a “cease and desist” letter. In the letter, ICE officials demanded that the firm remove pictures of individual ICE agents from their website and social media — pictures that had already been publicly broadcast on television by CBS News. To date, Amoachi & Johnson have refused to remove the content from their website. Facebook, however, caved under government pressure and removed their social media post without knowledge or permission. For more information about this unfolding story, see http://www.latinorebels. com/2018/01/04/facebook- censors-post-about-ices- intimidation-of-law-firm/. This recent attempt by ICE to intimidate immigration lawyers came on the heels of the Department of Justice (DOJ) trying out a similar tactic. In April 2017, the DOJ served a “cease and desist” letter to the Northwest Immigrant Rights Project (NWIRP), falsely accusing the lawyers of violating ethics rules by offering free services to asylum clients. NWIRP sought — and won — a temporary restraining order preventing DOJ and Attorney General Jeff Sessions from threatening their group, and others, from serving these cease and desist letters. However, litigation is ongoing. For more information, see https://abovethelaw.com/ 2017/05/doj-threatens- immigration-rights-lawyers- demands-they-drop-their- clients/. It is every attorney’s duty and responsibility to defend their clients as vigorously as possible, restricted only by the command that they do so within the law. In this regard, the law firms that were attacked by DOJ and ICE did nothing unlawful. A lawyer defending a client, or class of clients, not only has the right, but also the duty, to inform their clients of how to protect themselves by exercising their rights when confronted by law enforcement agents, including how they may legally avoid being confronted by law enforcement agents. And all lawyers, including those representing immigrants targeted by law enforcement agents, have every right under the First Amendment to the Constitution of the United States, no less than all other citizens, to advocate politically and strategically on behalf of protecting immigrants, be they documented or undocumented.